One of the hardest things to pack is a ski. Skis are long and bulky making them pretty hard to store or pack. 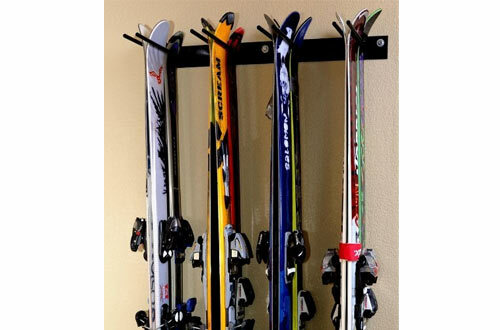 They will not fit in small places in your home hence the need to get the perfect ski racks for them. 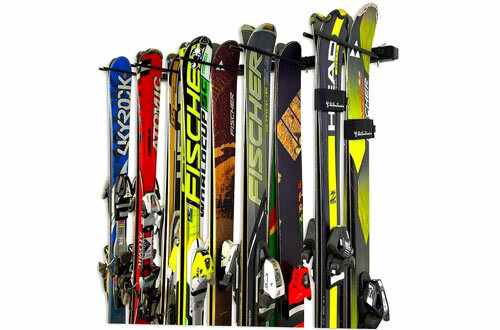 Ski racks help store your skis in the best way possible. They keep the skis in good shape for the next skiing. 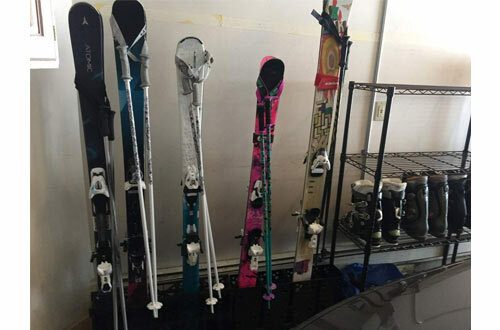 In this post, we are looking to review the best ski racks on the market for you to buy. 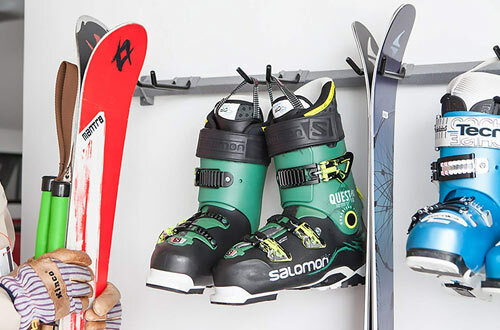 These are top-rated ski racks to help you store your skis. This is one of the most affordable ski racks on the market but one with great features to rival top models. 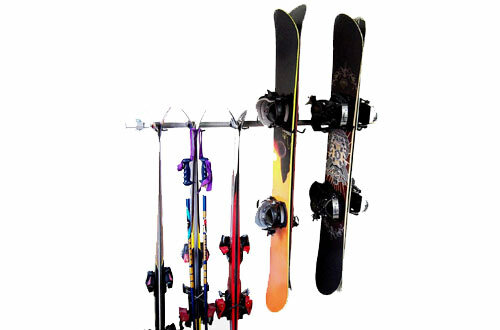 It is a heavy duty ski rack that helps store your skis horizontally. The racks are mounted on the wall and offer and hold up to three skis. The safely hold your skis a safe distance from the ground keeping them in the best condition possible. Overall, they are versatile ski racks that can also be used to store other gears like snowboards, water skis and skateboards. 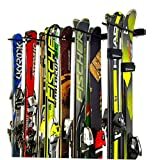 These are heavy-duty steel constructed ski racks with durable and sturdy construction to hold up to 200 pounds of skis. The racks provide five storage attachments where skis are vertically held. The attachments are 12 inches long and 0.75 inches wide and easily open to hold two pairs of skis. 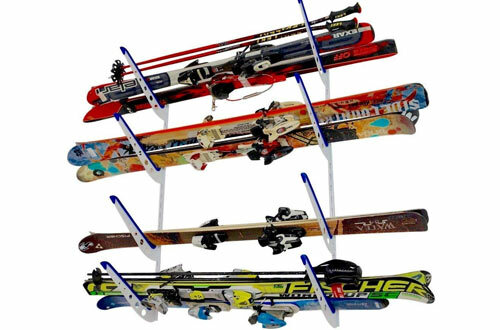 This is a quality rack that can easily be customized by attaching inserts along the wall to store any many skis as possible. Overall, Omni rack is a perfect ski rack for storing your skis on the garage. The Rough ski rack is another pretty simple design measuring 34 inches long. The rack helps store skis vertically with 45 inches of hanging space. 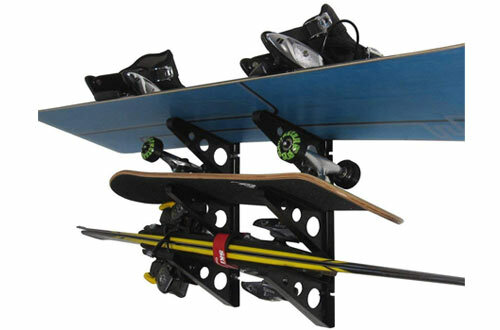 It is a versatile rack that can also store snowboards and skateboards. Overall, this rack can hold up to 8 pairs of skis and 8 snowboards. It is an excellent choice for storing skis of different shapes and sizes. The rack comes with all the necessary mounting hardware and instructions for easy assembly. 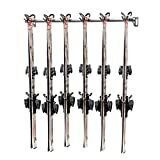 This is an easy and highly portable ski storage rack with a capacity to hold 4 pairs of skis. It is a great choice if you don’t want to drill any holes. The ski rack comes as a unit to fit skis insides without any mounting or installation. The rack is wide enough to fit 5 standard skis and 4 big skis measuring 140mm. It features a durable moulded plastic construction to support your skis without breaking. The Monkey ski storage rack can hold up to three skis and poles vertically keeping them safe from the floor. It is a pretty simple rack that mounts on the wall with ease. The rack features durable steel construction with all components coated to prevent rust and corrosion. Installation of the rack is easy and takes around 15 minutes. The rack can hold up to 200lbs. Hook slides on the bar allow for easy customization when storing your skis. This is a much bigger ski rack capable of storing up to six pairs of skis. It is a quality ski rack that comes rated 120 pounds. It can safely hang six skis and poles without warping or breaking. The entire rack framework features industrial steel for long-lasting durability. Powder coating on the metal further prevents corrosion and rust. Overall, this is an excellent way to store your skis safely vertically. This is by far the most versatile ski rack for safe horizontal storage of your skis. 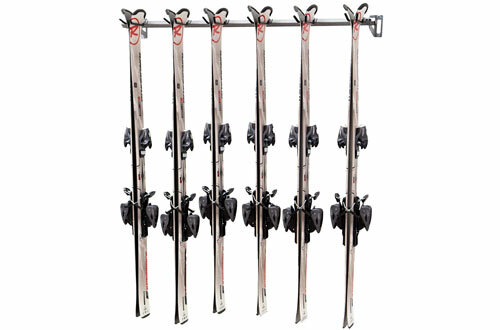 The rack features for horizontal attachments that each hold 4 to 8 pairs of skis. This means the rack can hold a maximum of 64 skis making it by far the strongest and largest ski racks on the market. It is easy to set up with four screws that attach it to the wall. Overall, the rack is multi-purpose and features padded arms to keep the skis safe from scratches and other damage. 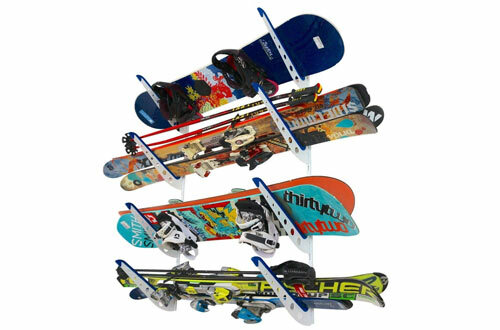 This is another versatile multi-wall snowboard storage rack but one that can also store your skis. 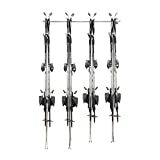 It is a top-rated rack with a heavy duty steel construction. It is quite durable and strong to hold one or two snowboards on each level. This is a 4-tier rack capable of holding up to 8 snowboards. You can only imagine how many skis it can hold. Mounting of the rack is quite simple with four screws on each rack. 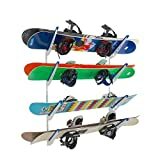 If you want to store both the snowboard and skis on the same rack, then this is an excellent choice to buy. It is a pretty versatile rack that stores skis and snowboards safely. The rack features a 3-tier rack system to fit skis, skateboard, snowboards and much more. The construction of the rack features lightweight engineering for easy mounting on the wall. All mounting hardware is included for easy mounting. The Monkey bar storage rack is our final choice for the best ski racks and a good one for multipurpose use. It is a pretty simple rack that easily installs on the wall. The rack safely stores skis and snowboards vertically. It features adjustable hook slides on the bar that hold the skis and snowboards. Overall, the rack can hold three skis and poles and four snowboards. It also comes with a lifetime warranty so that you can buy with confidence. These are the best ski racks on the market to help you store your skis, snowboards and skateboards safely. They are sturdy, strong and constructed of high-quality materials to serve you for long. Make sure you only buy after reading our reviews to get the best quality.